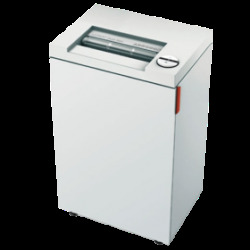 The Destroyit® 2465SC strip-cut shredder is a durable small office shredder that can also be efficiently used in homes. With a 19-22 sheet capacity users can now shred document with ease by converting them into 3/16" strips. The Destroyit® 2465SC features a high quality wooden cabinet, four casters for smooth mobility and most importantly environment friendly shred bin that does not require a shred bag separately. With zero ENERGY standby mode the shredder will automatically disconnect from the power supply exactly after 30 minutes. For users protection there is an electronically controlled safety flap. With the steel cutting shafts present within, proper wear and tear of the document, paper clips and credit cards is assured. The SSC™ (smart shred control) keeps the user updated about the shredding capacity to avoid any type of paper jamming that may affect the overall functioning of the shredder. To prevent the shredder from getting overheated, double motor protection is provided. All these features contribute in the smooth and quite operations of the shredder making it highly suitable for users who focus on using energy efficient products.